Today’s progress report suggests that Stratolaunch is closing in on the plane’s first flight — more than seven years after Allen founded the company, and three months after the billionaire’s death due to non-Hodgkin’s lymphoma at the age of 65. Last April, Stratolaunch executives said they were hoping to hit the “first flight” milestone by the summer of 2018, but on-the-ground testing has taken longer than projected. 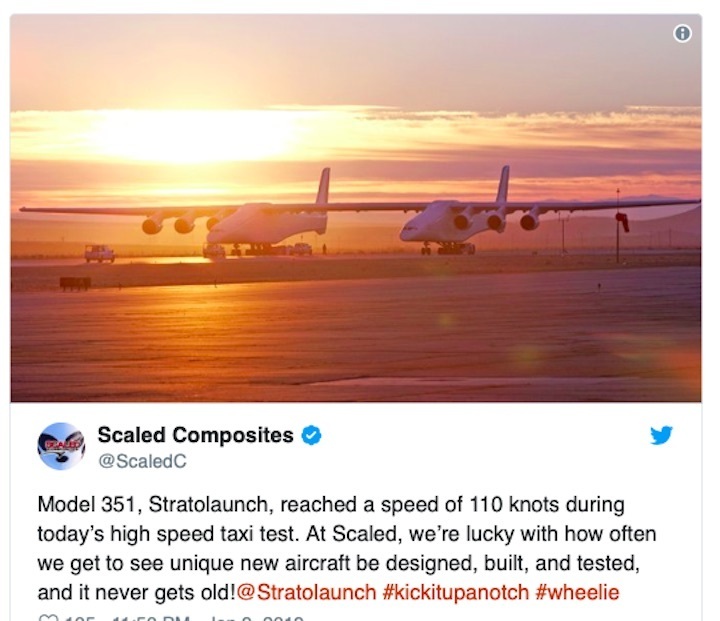 The Stratolaunch/Scaled team has been moving, step by step, through a series of increasing speedy runway run-throughs to test the plane’s performance. Stratolaunch expects the plane to receive certification from the Federal Aviation Administration after 18 to 24 months of flight tests. Then the plane would get ready to begin its role as a launch platform — probably sometime in the 2020-2021 time frame, if the schedule follows the company’s expectations. The flight profile calls for carrying up to 550,000 pounds’ worth of rockets and payloads beneath the center of the plane’s wings, between the two fuselages. When the plane reaches an altitude in the neighborhood of 35,000 feet, the rockets would be dropped from the mothership, fire up their engines and press onward to orbit. Such a system would allow for a launch into any orbital inclination, from anyplace within range of a suitable runway. It’s a super-sized version of the air-launch concept used for the SpaceShipOne rocket plane project that Allen bankrolled 15 years ago, as well as for Virgin Galactic’s SpaceShipTwo and Virgin Orbit”s LauncherOnesystems. Eventually, the plane could accommodate up to three rockets for separate launches during a single sortie. But for the first launches, the plane will carry only one 50,000-pound Orbital ATK Pegasus XL rocket. That’s meant to simplify the process for getting clearance for the initial launches, because the Pegasus is already being air-launched in this way from Orbital ATK’s modified Lockheed L-1011 carrier plane. 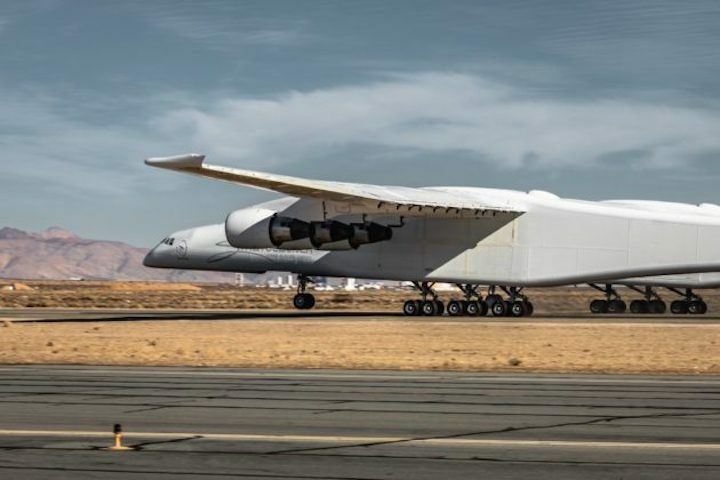 Stratolaunch says it hasn’t yet signed up customers, but it intends to put commercial payloads on its first launches — perhaps at a discounted rate. Looking further ahead, the company is developing a whole family of launch vehiclesto be carried on the plane, ranging from a Medium Launch Vehicle to a crew-capable space plane that’s been code-named Black Ice. To power those vehicles, Stratolaunch is developing a new breed of hydrogen-fueled rocket engine called the PGA (in honor of Paul G. Allen). The Medium Launch Vehicle could be ready to fly by as early as 2022, Stratolaunch says. The company is also developing hypersonic test planes that would use a PGA rocket engine as well as an air-breathing propulsion system. Stratolaunch hasn’t provided specifics about its potential customers, but the likeliest suspects include satellite operators and the U.S. military.